There are many different types of equipment used by your Southeastern Massachusetts emergency vet to provide comprehensive care for your pets. Veterinarians use many different types of imaging, such as X-rays, CT scans and MRI. Each type of scan provides different advantages that can be used to view issues going on inside of your pet. The most commonly used and valuable type of scan is the ultrasound exam for pets. Top quality clinics use veterinary ultrasound in Dartmouth for diagnosis and to perform other intensive procedures. Anchor Animal Hospital in Dartmouth uses veterinary ultrasound, along with other types of tests and scans, for dogs, cats and other types of pets who require treatment. 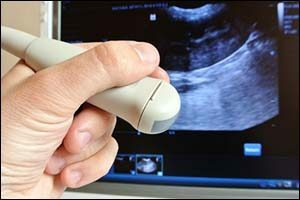 Similar to the technology that is used for sonograms during human pregnancies by obstetricians, ultrasound utilizes sound waves to create an image. It is a non-invasive test that has absolutely no side-effects. Some pets may require a light sedative, however, if they become too anxious during the procedure. This is to ensure that a clear picture is taken in order to properly diagnose a condition or provide accurate treatment. An ultrasound exam for pets is used to look at the shape of an organ, which can be very beneficial. Another clear advantage is that veterinary ultrasound in Dartmouth is faster and much more cost-effective for the animal clinic and for the client than other types of testing. A lot of information can be gathered through the use of ultrasound for a lot less cost than a CT or MRI. Overall, it is a great tool for diagnostics that has become very valuable in animal hospitals, clinics and emergency care centers all across the country. One of the ways that ultrasound exams for pets are used is to use it to scan a pet that has ingested something, such as a pet toy, a piece of clothing or something else that it shouldn’t have ingested. It can also be used to look at tumors and other internal injuries or conditions that might otherwise require surgery to view properly. Veterinary ultrasound in Dartmouth can reduce the amount of exploratory surgeries needed for certain conditions. In some cases, using both an ultrasound and an X-ray together can provide combination results that are extremely clear and beneficial. One of the reasons why an ultrasound exam for pets is so valuable is that it enables your Southeastern Massachusetts emergency vet to distinguish fluid from soft tissue masses, foreign bodies and other conditions. Many of the conditions that ultrasound can be used to diagnose can be life-threatening and veterinary ultrasound has been instrumental in providing a quick diagnosis in order to safe the life of the pet, especially in emergency situations. Ultrasound truly improves the quality the diagnosis provided by the veterinarian and, as a result, the care that can be delivered. Anchor Animal Hospital in Dartmouth is proud to offer ultrasound exams for pets as part of the many diagnostic tools available to our patients. Abdominal ultrasound is used at our office to provide diagnostics for many diseases, such as kidney disease, liver disease, bladder stones, pancreatitis, tumors, bleeding and much more. Ultrasound is also an excellent method used to check for pregnancy in dogs. It can even be performed just four weeks after breeding for accurate results. We first started using ultrasound at our clinic as a means to expand the cardiology practice spearheaded by Dr. Gerald Pietsch. He routinely performs echo cardiograms, which are ultrasounds of the heart, on pets that have heart disease. At Anchor Animal Hospital in Dartmouth, we have a room that is completely dedicated to providing valuable ultrasound exams for pets. The room is used to provide a space that is both quiet and comfortable to make the procedure easier for the pet. We even offer comfortable couches and beds for the pets to lie on during the exam. In fact, they are so comfortable that some of our canine patients fall asleep and even snore during the exam. We do have to shave the area where the ultrasound will be performed, as the hair can decrease the quality of the image and make it more difficult to get accurate results. Call Anchor Animal Hospital in Dartmouth to schedule an appointment for your pet, knowing that they will get the best quality care and results from our Southeastern Massachusetts emergency vet. Whether you need an ultrasound exam for pets or if you need vaccines, preventive veterinary care or other quality services, you can trust the team at Anchor Animal Hospital to provide you with excellent care. Call us today at 508-996-3731.